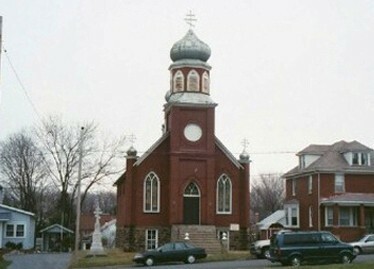 SS Peter and Paul Church in Boswell, PA is a satellite parish attached to Holy Assumption Church in Central City, PA.
Take US Route 30 east and turn left at traffic light onto SR 601. Follow SR 601 north for 1.3 miles. Instead of taking left to continue north on 601, go straight for 3 1/2 blocks. Turn right onto Quemahoning Street. Go 1 block. Church is on the left. Take US Route 30 west just past US 219. Turn right onto Ralphton Road (SR 4025). Follow Ralphton Road into town (becomes Main Street) for 1.7 miles. Turn right at Howers Avenue (Greg's Tavern). Go 3 blocks and turn left onto Quemahoning Street. Go 1 block. Church is on the right. Take US Route 219 north and take US Route 30 exit. Upon exit ramp, turn left and proceed westbound for 0.35 miles. Turn right onto Ralphton Road (SR 4025). Follow Ralphton Road into town (becomes Main Street) for 1.7 miles. Turn right at Howers Avenue (Greg's Tavern). Go 3 blocks and turn left onto Quemahoning Street. Go 1 block. Church is on the right. Take US Route 219 south and take US Route 30 exit. Proceed westbound for 0.35 miles. Turn right onto Ralphton Road (SR 4025). Follow Ralphton Road into town (becomes Main Street) for 1.7 miles. Turn right at Howers Avenue (Greg's Tavern). Go 3 blocks and turn left onto Quemahoning Street. Go 1 block. Church is on the right. Take I-76 to Milepost Exit 110 / Old Exit 10 (Somerset). Upon exiting the toll plaza, go straight at first light onto Pleasant Avenue. At second light, turn left onto SR 281 (Stoystown Road). Take SR 281 1.5 miles north to US Route 219. Take US Route 219 north for 8.6 miles to US Route 30. Proceed westbound for 0.35 miles. Turn right onto Ralphton Road (SR 4025). Follow Ralphton Road into town (becomes Main Street) for 1.7 miles. Turn right at Howers Avenue (Greg's Tavern). Go 3 blocks and turn left onto Quemahoning Street. Go 1 block. Church is on the right. Take I-99 south to US Route 22 (Milepost Exit 28). Take US Route 22 west for 21 miles to US Route 219. Proceed on US Route 219 south to Route 30 for 29 miles. Proceed westbound for 0.35 miles. Turn right onto Ralphton Road. Follow Ralphton Road into town (becomes Main Street) for 1.7 miles. Turn right at Howers Avenue (Greg's Tavern). Go 3 blocks and turn left onto Quemahoning Street. Go 1 block. Church is on the right. Take I-99 south to US Route 30 (Milepost Exit 1). Take US 30 Bypass West for 1 mile and US Route 30 for 30.5 miles. Take US Route 30 west just past US 219. Turn right onto Ralphton Road. Follow Ralphton Road into town (becomes Main Street) for 1.7 miles. Turn right at Howers Avenue (Greg's Tavern). Go 3 blocks and turn left onto Quemahoning Street. Go 1 block. Church is on the right. Due to the Rector's irregular service schedule, visitors are asked to call him for the exact date and time of services. All services are in English.